There is a new face at the city offices. Jeff Heyman has joined the city staff in its newly created role of communications analyst. Heyman started in the new position April 9, coming to the city from the Oakland-based Peralta College District where he headed up public information and communications for the 25,000-student district. Prior to his 18 years at the Peralta Colleges, Heyman was an information officer and deputy spokesperson for the United Nations Peacekeeping Department, serving in Cambodia, Rwanda, Angola and former Yugoslavia. Heyman, born in San Francisco, spent his teenage years in Alamo. He is a graduate of San Francisco State University in fine art photography and broadcast communications. "For a long time, the city has done the best job it can in communicating with residents about the many things we do, but with the world of communications and media ever-changing, and the rise of social media, we needed a new approach, and this is a set of skills staff does not currently have," said City Manager Steve Falk in a press release. 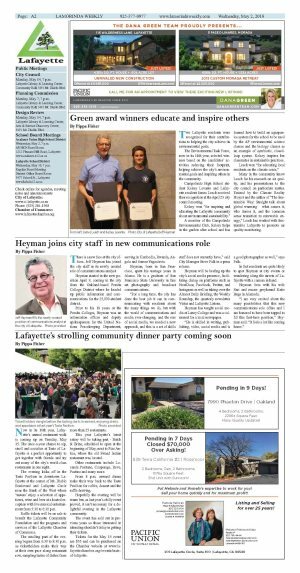 Heyman will be beefing up the city's social media presence, facilitating dialog on platforms such as NextDoor, Facebook, Twitter, and Instagram as well as taking over the Almost Daily Briefing, the Weekly Roundup, the quarterly newsletter Vistas and Lafayette Listens. 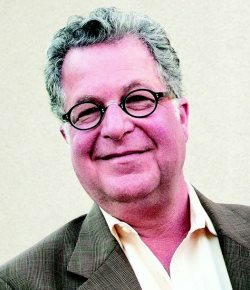 Heyman has taught social media at Laney College and was a columnist for a local newspaper. "He is skilled in writing, publishing, video, social media and is a good photographer as well," says Falk. In fact residents are quite likely to spot Heyman at city events or wandering along the streets of Lafayette with a camera in hand. Heyman lives with his wife Sari and rescue greyhound Katie Bugs in Alameda. "I am very excited about the many possibilities that this new communications role offers and I am honored to have been tapped to fill this first-time position," Heyman said. "It feels a lot like coming home."